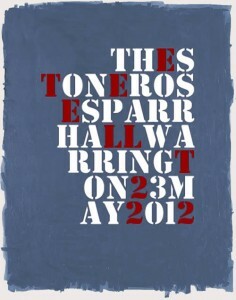 The Stone Roses are to play a short set tonight (Wednesday 23rd May) at Warrington Parr Hall. The concert is free. Wristbands (1 per person) can be collected from the Warrington Pyramid box office (next to Warrington Parr Hall) from 4pm today. Doors 8pm. To qualify for a free ticket to this very special warm up show fans will need to take a Stone Roses CD inlay cover, record sleeve, official band t-shirt or Heaton Park ticket with them to the Pyramid box office. All entrants must be aged 14+. The charity HUGS (‘Helping Uganda Schools’) will be collecting donations at the venue. If you’re lucky enough to get a ticket, leave a comment and let us know how the gig went. Can anyone update on queue levels?? Roses on stage at 9.30. Is the Warrington Park poster you have here official, or did you make it up on your own?